Can you ever be truly prepared for an invasion? What about a taco invasion? 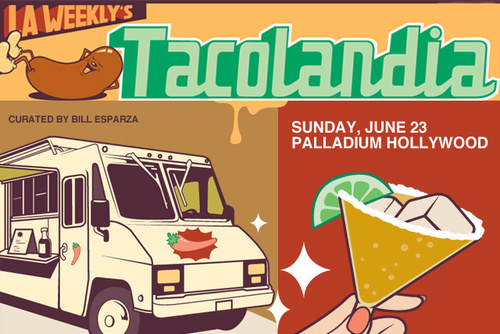 Tacolandia is set to hit Los Angeles on June 23rd whether you are ready or not. LA Weekly is teaming up with the World’s First Tacorazzo, Bill Esparza for an extraordinary summer taco fest which will include a selection of over 30 taco creators from LA/OC with even a few special tacos from Baja. A tequila garden will also be set up for VIP ticket holders to sample an array of tasty tequila and mescal. We were lucky enough to be invited on a preview tour of Tacolandia which was led by Bill Esparza himself and his future partner in culinary crime, Pete Bernstein, owner of Mustache Rides LA. Fifteen Los Angeles and Orange County bloggers stepped inside a mustache adorned van and set off to unknown destinations in search of taco greatness. 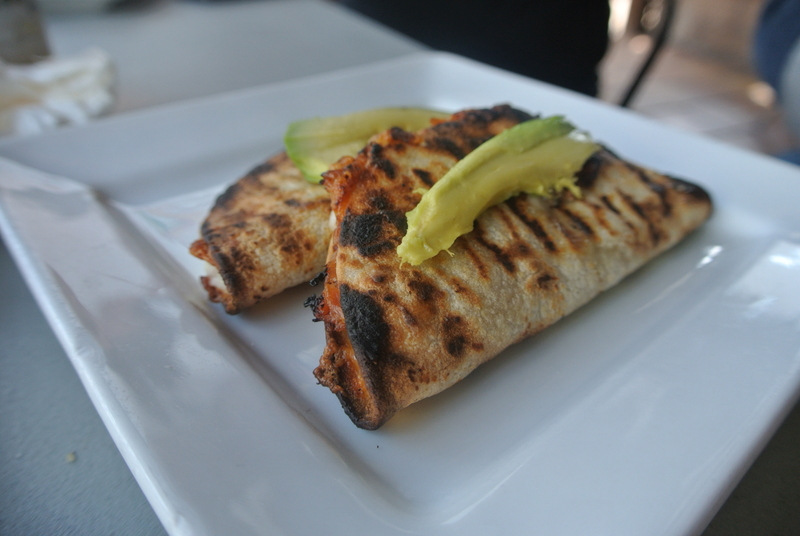 Our very first stop of the day was in downtown L.A at Mo-Chica. Ricardo Zarate gave each of us a warm greeting and lead us to the back of his restaurant to start our tour. 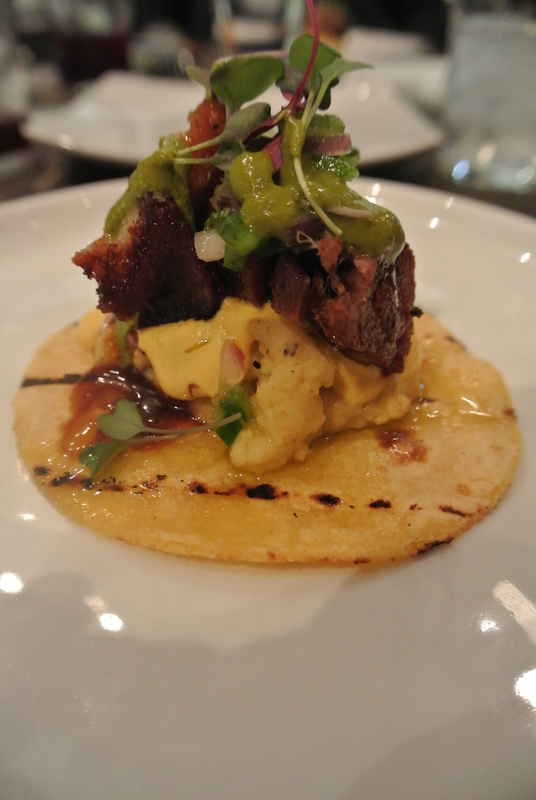 We sampled two Peruvian influenced tacos and each taco married both cuisines of Peru and Mexico perfectly. We washed each one down with a nice glass of purple corn. It was my first experience with the drink but I have to say it was a pleasant one. After a quick visit we were back in the van and on our way to the next destination. A scenic tour down the 110 freeway brought us to the always exciting area of Watts. 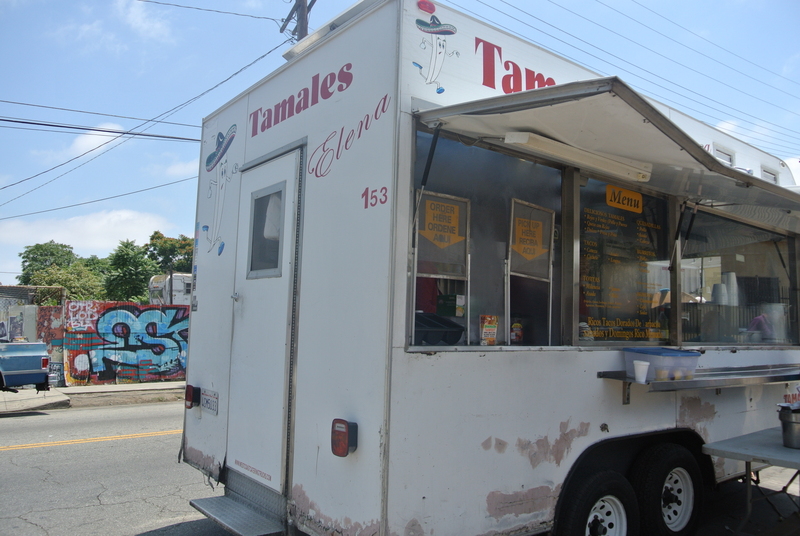 Tamales Elena have set up a mobile restaurant on the side of Wilmington Ave. Tamales is in the name and of course they are good but what you are looking to purchase here are the tacos. Barbacoa, beef cheeks and beef lips are hard to come by but when you can find them, it’s a treat. If you are not turned off by wandering dogs and a permanent residence of homeless folks on the corner of the street, this is the place to come. A quick trip west brought us to Inglewood, home to Coni’ Seafood which serves some of the freshest seafood in all of Los Angeles. A plethora of food was continuously coming out of the kitchen including several types of ceviche, smoked marlin tacos, shrimp aquachile and more. On most occasions, you will see the mother and daughter team of Coni’ Seafood on site to give you the best experience possible. Want to experience Baja, without crossing the border? This is the place to visit. After a serious feast at Coni’, most of us weren’t sure we could handle any more food but when you mention a taco stand specializing in Carnitas that isn’t exactly on the up-and-up, how can you pass that up? So as our trip to South L.A. began, a billion expectations crossed my mind. Will we need a secret password? Can we ever speak of this moment again in public? Well, as it turns out, it was just an average taco stand on the side of the road but after first bite, you realized this wasn’t your everyday taco stand. After trying the lengua and buche, I knew this was a special place that needs to be visited more than once. If you want to experience these great tacos, join Bill and LA Weekly at Tacolandia on Sunday, June 23rd at Hollywood Palladium. Purchase tickets here. If you are interested in conquering the L.A. street food scene, be on the lookout for Bill and Pete’s upcoming tours they will be leading in the very near future. For more photos of this tour, head to our Facebook page.